I was checking out the mailing address for my commission and, lo and behold, it’s really going to Grand Rapids, Michigan, not Georgia. The zip code looked wrong to me for Georgia and sure enough, it was really in Michigan. Slight mistake by the buyer, but all’s well that ends well. I’m glad I checked. The zip was right so it probably would have gotten there eventually, but no need to tempt fate, I say. I worked on the color the last few days and am pretty satisfied. The brick was hard to do. The two sets of photos, taken years apart, showed very different brown color combinations and I had to ask which was closer to the real thing. One set had definite peach undertones to it, complimenting the half moon inserts and the other showed a much darker combination of browns. I went with the lighter combo. I really like the flower boxes and the colorful front landscaping. It really adds to the overall effect of the house. The little gate also adds a point of interest. I know the ivy on the right doesn’t shows light in this photo, but it looks fine on the real thing. One more session for tweaking tomorrow and then its’s of to its destination – northern instead of southern. Well, I must say I am pretty pleased with the portrait so far. It was a little complicated using older pictures for the landscaping and newer ones for the structure itself, but it turned out fine. I ended up doing the left and right landscaping last because I had to determine what I needed to do. The right side views conflicted, new and old, and the left was partially blocked by a car. I thought long and hard how to resolve the issues. I laid down the preliminary pastels today but it will still take several days to finish. It is so large I have to stand at my table when I work on the upper area. And after I do finish, I will need to let it sit for a day to get fresh eyes. Even if I finish it by the weekend, I may wait until after the holiday to send it out. This is taking quite a while to ink in due to its large size. Instead of 2 maybe 3 days for the inking, this will take 5 to 6. 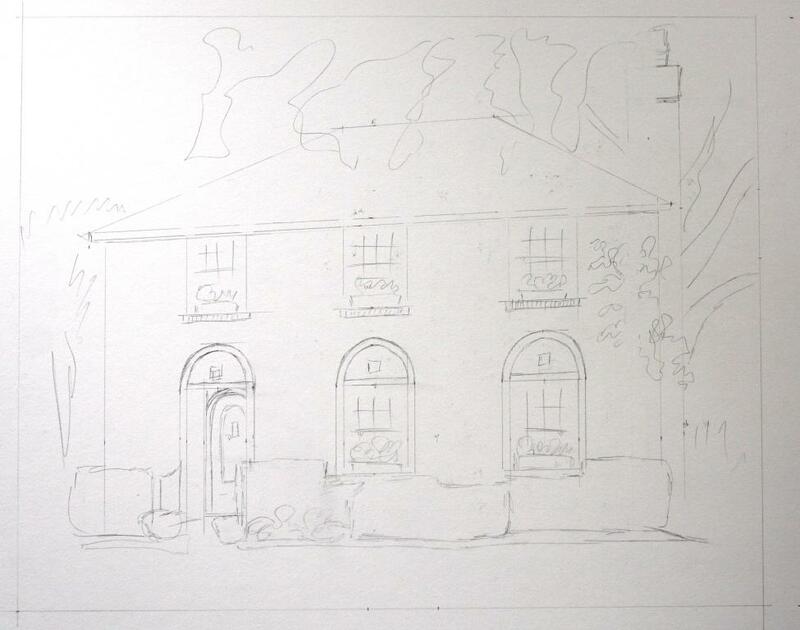 The large size (20″x16″) alone dictates extensive work, but I have had to do a lot of pencil preliminary too. 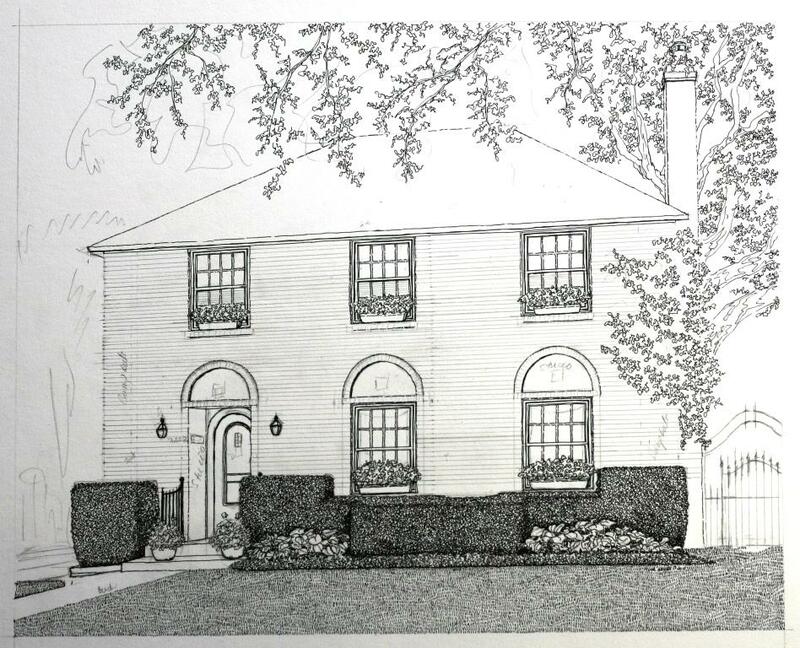 I only do one this big every few years, but at least this is an interesting house for the work. It is going to end up being a study of positive and negative space before I get to the pastels. Something this large will need to have good balance. So far I am pleased, but it is taking a long time as I have to lay out much more in pencil before I ink it. Once I get the brick in, the evergreens won’t look quite so dark. The ink is not really quite as dense as it appears here for them. It darkened up somewhat when I used the auto-correct in picture manager. No big deal for here. I really like what the window boxes have done for the presentation. Along with the half rounds above the windows, they make a flat brick facade quite attractive. The little little gate off to the right is quite pretty too. The left is just the driveway, but it should turn out okay as long as I keep the black/white balance good. The rest should go more quickly as I have most of the pencil layout already in. It’s probably 2 more days anyway. The pastels should be much quicker. 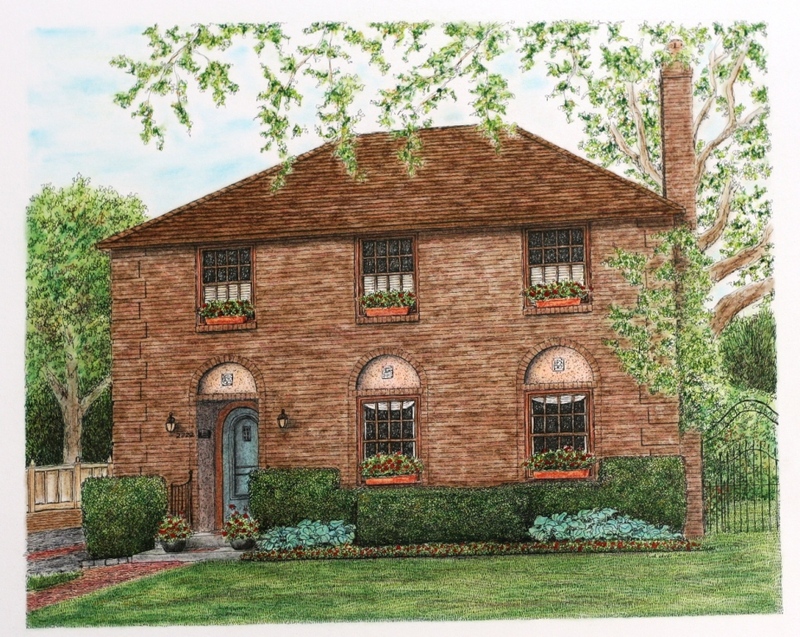 While I was working on the Jasper streetscape, I received an inquiry for a home portrait. 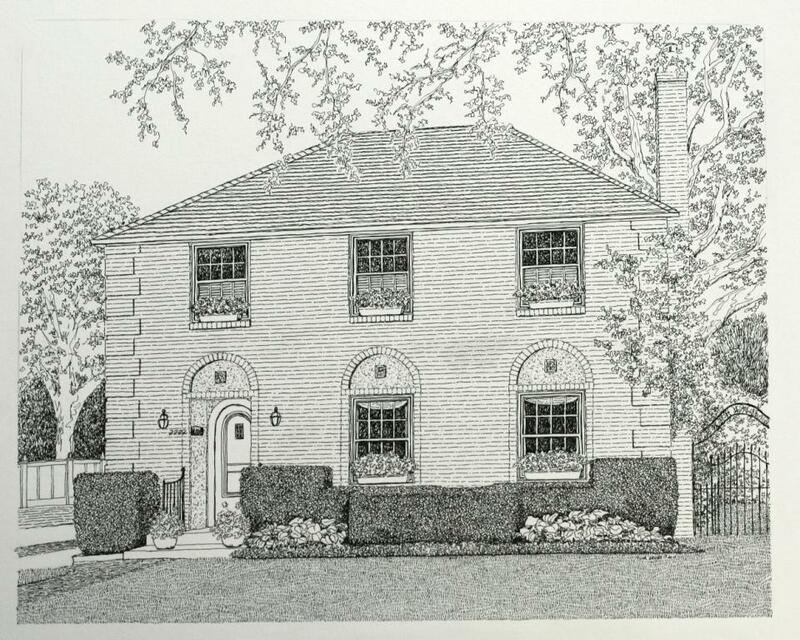 The children of parents celebrating their 50th anniversary in June wanted to know if I could create a portrait of the home that they all grew up in as a special gift and get it to them before the celebration. I readily agreed. It’s not often that I get that much lead time and I should be able to get it to them in plenty of time to have it framed. It is a lovely full brick house. The brick is multicolor brown with undertones of peach. The archways and doorway inset are a peach stucco with interesting block inserts of a sailing ship and oak trees. The landscaping is quite lovely, too. The evergreen shrubs are mature and nicely shaped. Most impressive though are the window boxes filled with bright red impatiens flowers. Red flowers also line the base of the shrubbery. The door is a light teal. Someone really loved color. As a funny aside, the person I have been e-mailing with wanted to make sure that I included the offset brickwork on the corners. He said that when they were younger, they used to climb the bricks like a ladder and it was a treasured memory. Easily done and I couldn’t imagine not putting it in anyway, as it is a feature of the house. I think he just wanted to make sure. It is a large portrait at 20″x16″ so it will take a while to finish. Inking starts tomorrow, pastels by the end of the week. Well, after a week away visiting with family, I finally got back to the studio. 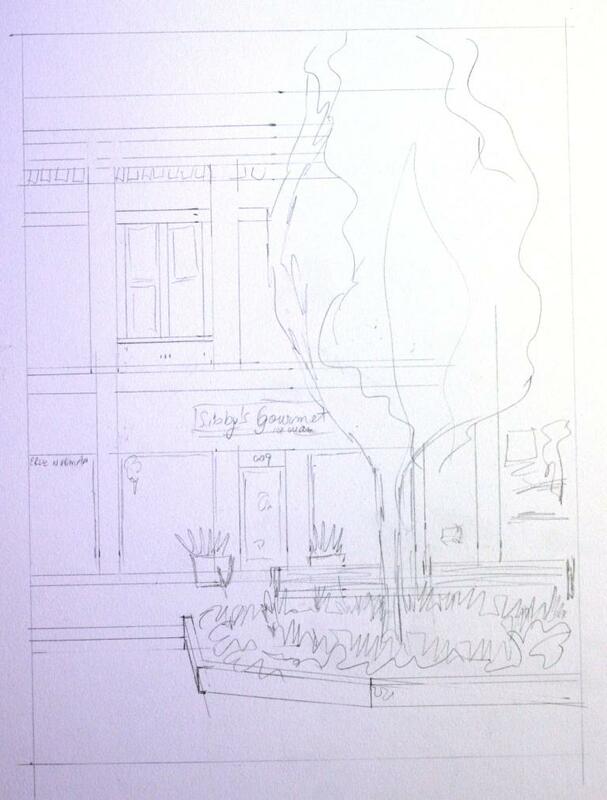 I picked another view of the Jasper town square and penciled it up yesterday. It, too, has the lively colors of the others. The ice cream shop has dark and light shades of lilac, with orange brick above so the colors will vivid once again. I look forward to putting on the watercolors. Spring has sprung here. The redbud trees are just about finished, although the dogwoods are still blooming quite nicely. This year my red dogwood managed to avoid having its flowers eaten by the deer and I had at least a dozen flowers on its small frame. I should be out looking for morels, but I have a sneaking suspicion that we may be too late already. My irises are budding and the daffodils are finished. I love spring. Maybe that is why I like green so much.